Staff Sergeant William Kundrat, a native of Frederick, Maryland, graduated from Gov. Thomas Johnson High School in 2002, the same year he achieved the rank of Eagle Scout in Boy Scout Troop 799, Fort Detrick, Maryland. He enlisted in the Marine Corps in 2002, first serving with with Weapons Company, 2nd Battalion, 6th Marines as a Machine Gunner from 2003 to 2006, deploying in support of both Operation Iraqi Freedom and Operation Enduring Freedom. In August 2006, Staff Sgt. Kundrat reported to Foreign Military Training Unit, Marine Special Operations Command. Upon completion of the MARSOC Advisor Course, the pre-cursor to today’s Individual Training Course, he was assigned to Team 11, Bravo Company, Marine Special Operations Advisor Group, which later became Marine Special Operations Team 8314, 3rd Marine Raider Battalion. Staff Sgt. Kundrat deployed to the AFRICOM and CENTCOM areas of operations four times in support of Operation Enduring Freedom. 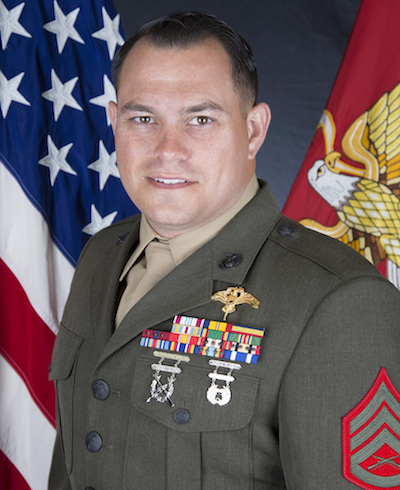 He was then assigned to Special Operations Training Cadre 1, Marine Raider Training Center, serving as a ground combat and amphibious skills instructor, as well as the Chief Instructor for MARSOF Helicopter Insertion and Extraction Techniques. SSgt. Kundrat joined 2nd Marine Raider Battalion on May 8, 2015, serving as an Element Leader for Marine Special Operations Company, Team 8231. His prior assignment was Operations Chief, Personal Security Detachment, Headquarters, Special Operations Joint Task Force-Afghanistan. SSgt. Kundrat’s personal awards include Defense Meritorious Service Medal, Combat Action Ribbon, Sea Service Deployment Ribbon (4), Marine Corps Good Conduct Medal (4), Afghanistan Campaign Medal (3); Iraq Campaign Medal (5), Global War on Terrorism Expeditionary Medal, Global War on Terrorism Service Medal, National Defense Service Medal, Joint Meritorious Unit Award, Navy Meritorious Unit Commendation (2), Navy Unit Commendation Medal, Presidential Unit Citation-Navy, NATO Medal-ISAF Afghanistan and Certificate of Commendation (Individual Award) (2).